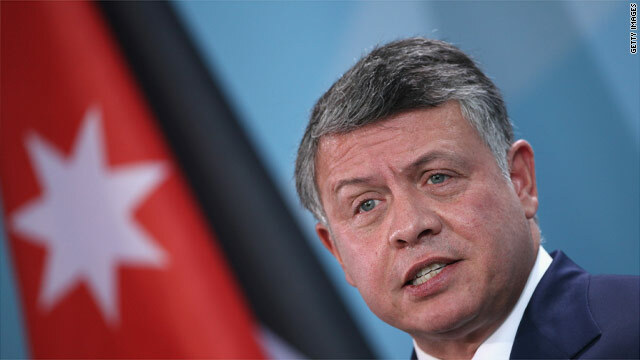 (CNN) – A little more than a week before Mitt Romney's overseas trip that includes a visit to Israel, Jordan's King Abdullah said he believes the presumptive GOP nominee understands that brokering peace between Israelis and Palestinians remains the top goal in the Middle East. Speaking to CNN's Wolf Blitzer in an interview set to air beginning at 4 p.m. ET, King Abdullah said his meeting with Romney last year led him to believe the candidate has a solid knowledge of how important the peace process remains. What are the differences King Abdullah sees between Mitt Romney and President Obama? Tune in Wednesday to "The Situation Room with Wolf Blitzer" at 4 p.m. ET on CNN to find out. "He came to visit me almost a year ago, and we had a discussion about the challenges the peace process," King Abdullah said. "He understands that with the Arab Spring and all of the other issues that we have, the core issue still is the peace process, the two state solution between the Israelis and Palestinians." Romney is set to visit Israel at the end of July as part of an overseas tour that will also include a trip to the 2012 London Olympics. King Abdullah said that trip would "bring him up to speed on the ongoing negotiations between the Israelis and Palestinians." "Our job is to keep the discussion alive until the end of this year when American elections are finalized, depending on who wins of the two candidates," Jordan's leader continued. "That puts us in a better position to understand how to move the process forward at the end of next year." During this election cycle, Romney has been harshly critical of President Barack Obama's handling of the U.S. relationship with Israel. At the Republican Jewish Coalition in December, Romney took the president to task for not saying enough about the thousands of Hamas rockets fired into Israel, and for encouraging Israel to adopt what Romney called "indefensible borders." "These actions have emboldened Palestinian hard-liners who now are posed to form a unity government with terrorist Hamas and feel they can bypass Israel at the bargaining table," Romney said at the forum in Washington. "President Obama has immeasurably set back the prospect of peace in the Middle East." On its website, Romney's campaign lays out very broad strokes of a plan for Israel and Palestine, saying "Mitt's policy will differ sharply from President Obama's." At a CNN-sponsored debate in Florida in January, Romney addressed the notion of a two-state solution that would result in an independent Palestinian state alongside Israel. "There are some people who say, should we have a two-state solution? And the Israelis would be happy to have a two-state solution. It's the Palestinians who don't want a two-state solution. They want to eliminate the state of Israel," Romney said. The debate was held in the heat of the GOP primaries. Romney continued: "The best way to have peace in the Middle East is not for us to vacillate and to appease, but is to say, 'We stand with our friend Israel. We are committed to a Jewish state in Israel. We will not have an inch of difference between ourselves and our ally, Israel.'" No facts just asking a question with absolutely NO HOPES whatsoever of getting an answer, much less a straight one. Great news. Perhaps we can have Mr. Romney run for office in Jordan or Israel instead. Is Obama out bowing to dictators again? Dominican mama 4 Obama – No just tired of false acusations being throw around to see what sticks against the wall. Anyone can play that if you'd like. They haven^t had peace in that area in the last fifty thousand years so what new. Bless. Dominican mama 4 Obama – I heard Obama ate another domestic dog and raped a child last week. Is it true? @Sniffit "Well, it's well established in the historical record that GOPer Presidents love to support the dictators they like while seeking excuses for going to war with the dictators they don't." Libya, robots bomb drones, 1000's of dead non-combatants. You better add Obama to that historical record too. When it comes to military, Obama = Bush #3. FACT: Anyone thinking one party is 100% right while the other one is 100% wrong isn't worth listening to. QUESTION: So what does it mean when the Republican Party is 100% right? Who cares what he thinks? He presides over a country with no oil that receives a ton of foreign aid to stay afloat.